This is my intepretation of Obi-Wan Kenobi's lightsaber from Episode I, whilst he was still a Padawan under the tutelage of Qui-Gon Jin. Padawan's would quite often construct their own lightsaber in the likeness of their master's saber, and for me, this is one of the more elegant designs in the SW universe. 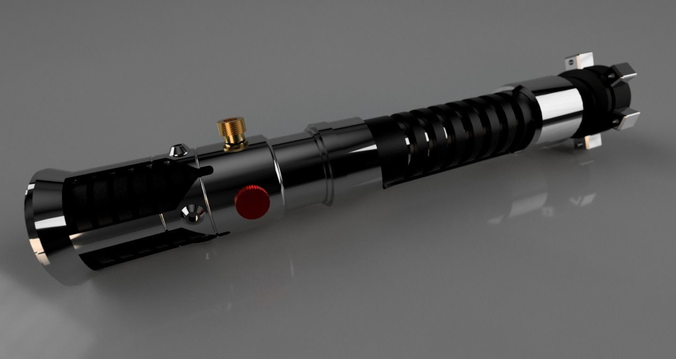 Unfortunately, this saber was lost whilst Kenobi was in a duel with Darth Maul during the Invasion of Naboo. This replica saber has been designed with 3D printing in mind, tolerances should allow you to easily assemble the saber, with key guides making it a simple process to align all the parts, with minimal support required. You can insert a cut-down clear red LED into the gold button stl to complete the look.